I begin this episode by reflecting on how I first remember seeing Patricia. It was after a long bus ride to a mall in New Jersey to watch her compete in an aerobics competition. Fast forward to sitting across from my dear friend over two decades later for a heart opening conversation about, life, love and kindness. We talk about Patricia’s highlight reel and her backstory. It was when Patricia was at her highest moment in her career that everything fell apart behind the scenes. A year into a national television show that she was hosting, Patricia was called in to a meeting with the management team and was confronted about her increasing weight that was magnified by being on camera. This low moment became a pivotal moment, and was the catalyst for her current work. “Thin at any cost” was Patricia’s mantra for many years and she was determined to move out of that mindset, and help thousands of women do the same. We talk about Patricia’s investigation into her own life and how she was determined to create a methodology that would allow us to create sustainable change in a healthy and productive way. We both talk about our struggles with trying to show up as our best self. Patricia shares her journey of how she kept moving forward determined to share her work while allowing her fear to sit in the backseat. It was in her vulnerability that she found her power. We talk about the long road to her “overnight” success of Intensati and Patricia reveals the struggles, failures and the many iterations that were needed for her to build her brand and move from having a career to her calling. Patricia is willing to talk about the hard stuff – the truth that fitness and health is not easy. She believes that much of the frustration and failure comes with the notion that the road to heath should be easy. One of Patricia’s core beliefs is that a strong body is a requirement for a great life – for our energy – our vitality and our dreams. It is your joy and your gratitude that will bring out the beauty in you and your life. 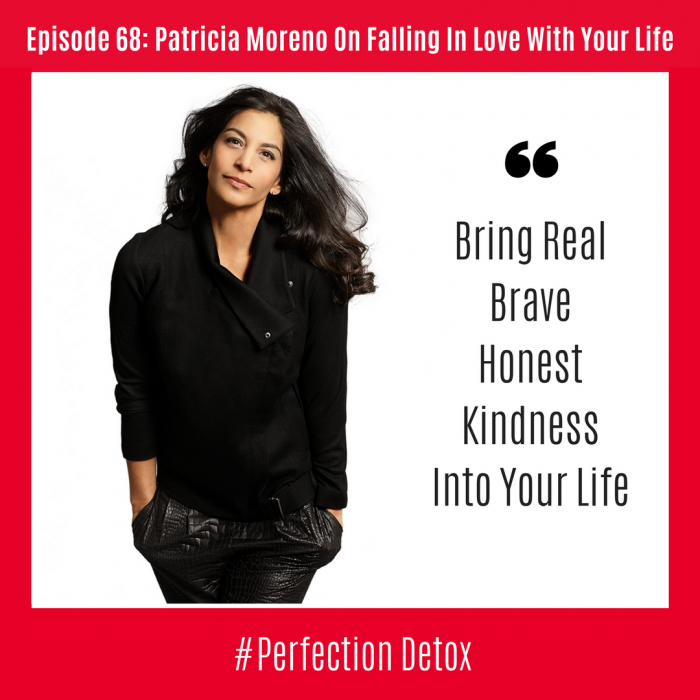 Patricia Moreno is the founder of spiritual fitness and with over 20 years of teaching and public speaking experience, she has been a trailblazer in the wellness world for many years. Creating integrative practices, innovative workouts and empowering leader trainings, Patricia has changed the lives of tens of thousands of people worldwide. Patricia is committed to being a powerful force for positive change in the world, and continues to find revolutionary ways to uplift and motivate others to practice self-love, positivity and gratitude. Her latest offering is the culmination of her years of work, study and practice; Sati365 synthesizes Patricia’s personal coaching program in the form of a self-study and practice program, centered around a daily morning practice including success principles such as meditation, visualization, goal setting, affirmations and movement to make every day the best day. Patricia is an international speaker, inspiring worldwide at Google, Equinox, Nike, Reebok, and The Limited among other notable organizations. She has been featured in publications such as Oprah Magazine, Vogue, Shape, Glamour, Well + Good, and on the Today Show, Ask Dr. Nandi, Good Morning America and Dr Oz.